Louisiana is a major producer of oil, natural gas, and petrochemicals. The state is home to the greatest concentration of crude oil refineries, natural gas processing plants, and petrochemical production facilities in the Western Hemisphere. Louisiana pioneered offshore oil and gas exploration and drilling and is the second larger producer of natural gas and the third largest producer of petroleum in the country. 25 percent of the nation’s petrochemicals are produced in Louisiana. While these industries drive the state’s economy and provide thousands of jobs, the work is hazardous and sometimes deadly. The most headline-grabbing industrial accident in recent years was the explosion and fire on the Deepwater Horizon oil rig off Louisiana shores that killed 11 workers and injured 17. In a single week in 2013, two chemical plant explosions—one in Geismar and another in Donaldsonville—killed 2 workers and injured 80 others. Such incidents are not merely “the price of doing business.” They are preventable accidents that have real and devastating consequences for workers and their families. 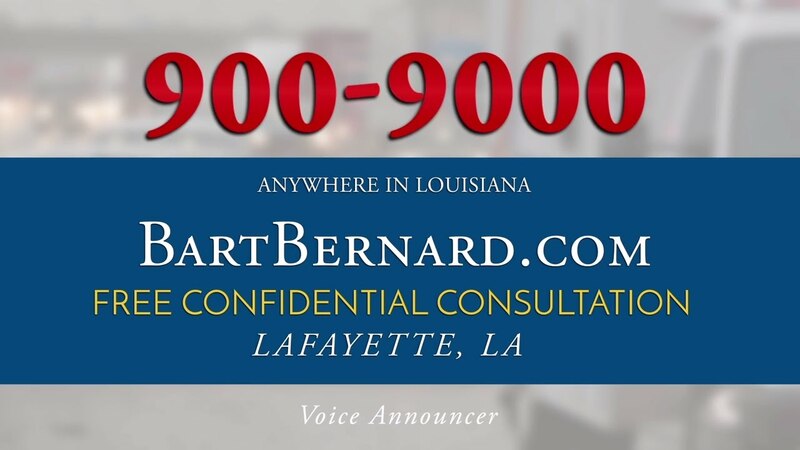 Attorney Bart Bernard helps injured Louisiana workers who need legal advice. If you are not being treated fairly, call Bart Bernard. We will get you the settlement you deserve. We’ll be with you every step of the way. Louisiana has 100 chemical plants and 17 oil refineries. Off the coast of Louisiana there are more than 4,000 production platforms and drilling rigs. These can be very dangerous places to work. The New York Times, for example, notes that in a single year, 1,270 people died in more than 30,000 chemical spills and accidents. The offshore oil and gas industry, moreover, has a fatality rate 7 times higher than for all U.S. workers. Workers who are considered “seamen” can seek benefits through the Jones Act. Non-seamen maritime workers (such as offshore oil and gas workers) are eligible for benefits through the LHWCA (learn more about the distinction between different types of maritime workers here). Workers who do not fall into one of these categories may obtain compensation through the Louisiana workers’ compensation program. Petrochemical workers present an interesting case, because their place of work is often along a waterway. On a single 10-mile stretch of the Mississippi River (a “navigable waterway”) in southern Louisiana, there are 12 petrochemical plants. If a worker’s duties regularly involve loading and unloading materials in a dock area, for example, the case could be made that a worker qualifies for LHWCA benefits, which typically are more generous than regular state workers’ compensation benefits. Bart Bernard Injury Lawyers will closely evaluate your work duties in order to determine the most effective means of seeking money for your losses. In some cases, it is possible to file a lawsuit against a 3rd party (other than your employer) seeking additional compensation. If you have been hurt or lost a loved one in an industrial accident, you may have the right to pursue significant compensation for your losses. Many industrial accidents are found to be a direct result of management’s failure to correct maintenance issues and violations of industry regulations. The U.S. Chemical Safety Board, the Occupational Safety and Health Administration (OSHA), the National Transportation Safety Board and other agencies created these regulations in order to protect workers. It is the employer’s duty to see that they are closely followed. The knowledgeable Baton Rouge personal injury attorneys at The Bart Bernard Injury Lawyers have helped countless clients obtain the compensation they deserved after sustaining serious injuries in industrial accidents and explosions. We have listed some of the most commonly asked questions about industrial accident and explosion cases below so you can begin to better understand the legal process. For answers to your specific questions and a free claim review and confidential consultation, contact us now by phone at 225-275-BART or fill out our simple online form. I Am Being Pressured To Not Report My Injury. What Should I Do? Many workers are pressured by employers to not file a claim after an injury. An attorney can help you better understand your options and rights at this time. You should not have to fear losing your job due to reporting your injury. Speaking with an attorney as soon as possible can help you understand the appropriate action to take in your case. In Louisiana, virtually all employers must provide workers’ compensation coverage for their employees. If your injury is job-related, you may be entitled to medical care, disability compensation and rehabilitation through workers’ compensation. In many cases, however, workers’ compensation does not provide an amount commensurate with the damages. In such an instance, an attorney can assist you with pursuing potential options for obtaining additional compensation for your injuries. Why Are My Employers Liable For My Injuries If It Was An Accident? These accidents cause thousands of injuries per year. OSHA states that an estimated 60,000 deaths and 860,000 occupational illnesses per year in the U.S. are attributable to occupational exposure. Understanding who may be liable for your injuries is something that you can discuss with your attorney once he or she thoroughly reviews your case. The subject of liability for an industrial accident can become very complex. In some cases an attorney may find after investigating your case that one or more parties is responsible. That is why it is recommended that you speak with an attorney regarding your case as soon as possible. There Was An Explosion At Work. How Will I Pay My Medical Bills? Industrial plants and oil refineries are hazardous work environments where workers face various dangers on a daily basis. Electrical fires, propane tank explosions, oil refinery explosions and plant explosions cause catastrophic injuries and deaths every year. In a single recent year, the U.S. Department of Labor reported that there were 148 fatalities due to fires and explosions in the workplace. In many of these cases a negligent party contributed to the cause of the explosion. Plants and refineries are high-risk environments where accidents can be avoided only through strict adherence to regulations. Workers’ compensation was designed to help individuals who have sustained workplace injuries, however, in many instances additional compensation must be sought in order to provide the injured individual with the full amount that they are due. Do I Need To Hire An Attorney To Handle My Industrial Accident Case? Your attorney will fight to get you the compensation you deserve, but there are some things you can do to protect your interests. Motorcyclists are commonly, and unfairly, portrayed as being reckless even when they ride safely. Follow the steps below to help your attorney build a strong case on your behalf. Do not give any statements to the other party’s insurance company. Share the information you obtained at the accident scene (the contact information of any witnesses, photographs of the scene and vehicles, etc.) with your attorney. Visit your doctor and follow all orders he or she gives you. Take photographs of your injuries and keep a journal of your daily condition. Preserve the clothing and gear you were wearing at the time of the accident. Keep all receipts for out-of-pocket expenses stemming from the accident. Consult your attorney if you are unsure of what to do.